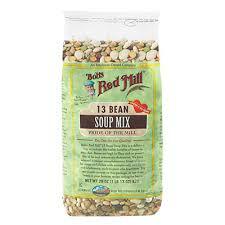 Bob' Red Mill 13 Bean Soup Mix is a delicious way to include the health benefits of beans in your diet. A unique, complementary blend of beans for soups and chilies with exceptionally rich flavor and wholesome, stick-to-your-ribs heartiness. Beans are high in fiber, low in fat and contain no cholesterol. Soak, and cook with your favorite vegetables such as tomatoes, carrots, celery, onion and garlic and cook in vegetable, chicken or beef broth for added flavor.